Gold Flake III is the newest subdivision of the neighborhood, which rests on the first hill east of the historic district. Like its predecessors, the Gold Flake III homes for sale are all custom-built on large lots, very close to, but not in, downtown. The third filing is primarily located on a cul-de-sac just east of Pine, and includes three parcels of open space and is both recorded as Gold Flake 3 and 3a. From any home for sale in Gold Flake III the views west to the Tenmile Range are often panoramic. Many of the homes have west-facing decks because the subdivision gets long, afternoon sun. Summer or winter, the walk down to town from Gold Flake III is, at most, a block farther than the other Gold Flake Streets, and it is easy via neighborhood trails - only about 15 minutes - although a little more strenuous going home. Directly to the north, is another single-family neighborhood, the Weisshorn, and both neighborhoods get very little drive through traffic. Keep reading about this new addition to the community, or find available Gold Flake homes for sale listed below. The first claims to this land were for mining – gold – and thus the name of the subdivision. The third filing was once part of the Bonanza claim. Ski home construction began in the 1980s when five lots were developed between Lincoln and Washington streets on the first terrace above the historic residential streets. After 2000, Gold Flake III was platted, and the neighborhood was extended to the east to the edge of Breckenridge Heights, which is still unincorporated Summit County. 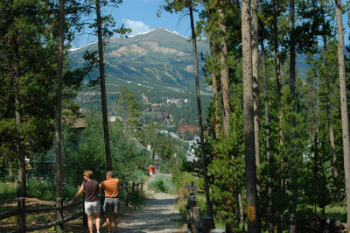 Through the Breckenridge Open Space and Trails Commission, developers deeded land and easements that allowed the town to create forested walking paths through the neighborhood that lead from town, over open space to the national forest. 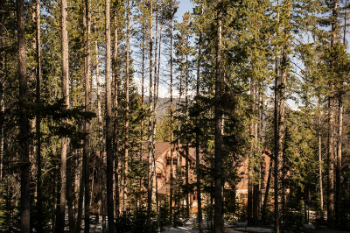 Set on a steep hill, uphill from downtown Breckenridge affords this neighborhood great views of the Breckenridge Ski Area, although many lots are heavily treed so the view may be filtered. The neighborhood is above and away from the bustle of town, but is a quick, if steep walk away. Size (sq. ft. liv. area): 4512 sq. ft. to 5464 sq. ft.
HOA: Gold Flake III, Breckenridge Lands, erik@breckenridgelands.com; link to HOA docs. Amenities: Less than ½ mile and a 15-minute walk to town, yet up above it. Town trail system is easily accessed, and the views of the Tenmile Range are spectacular. The neighborhood roads are paved and the homes well maintained. Directly above the last historical street in Breckenridge, and south of Lincoln is the Gold Flake neighborhood. Drive east on Wellington Road about .5 mile from Main Street, and turn south (right) on either Pine or Gold Flake and you will find all of the Gold Flake homes in this loop. Gold Flake III will be on Pine, or off to the east on Stillson Placer Terrace. 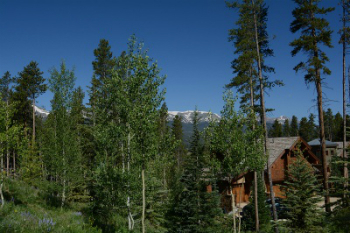 As Breckenridge locals, we pride ourselves on having the best local real estate information. Send us a message today to start working with a Breck local.